ADVANCED POROUS MATERIALS (APM) is an international peer-reviewed journal that publishes research activities on the fundamental aspects, synthesis, advanced characterization, structural properties, and multiple applications of all kinds of novel micro, meso-, nano- and macro-porous materials. APM also offers unique opportunity to report the energy and environmental related applications of advanced porous materials addressing significant environmental problems as a result of global climate changes. 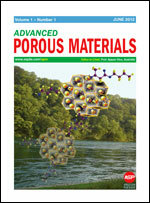 APM publishes reviews, full-length papers, and short communications, covering materials including zeolites, zeotypes, metal organic frameworks, layered materials, porous carbons, nitrides, metals, polymers, phosphides, chalcogenides, transition metal oxides, hydroxyapatite, gels, fibers, ceramics, glasses, membranes, and thermoelectric materials, mesoporous silica, amorphous and crystalline mesoporous metallosilicates, mesoporous hybrid materials, nanocomposites, porous organic molecules, graphenes, and open framework materials, and their applications in catalysis, sensing, adsorption, separation, drug delivery, magnetism, battery, supercapacitors, solar cells, nanodevices, and fine chemical synthesis.